The first team of English cricketers to tour Australia departed from Liverpool in 1861 aboard the SS Great Britain. The voyage took two months. Almost a century later, in September 1958, the last England team to travel to Australia wholly by sea took 16 days to complete the journey. Four years later in 1962 Ted Dexter’s side flew to Aden, then part of the British Empire but now in Yemen, before sailing on to Australia aboard the SS Canberra. Cricketers touring Australia and New Zealand have, since then, always travelled by air. 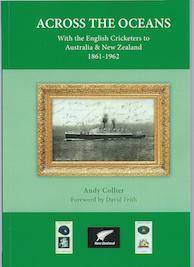 Across The Oceans is in part about the ships that took 32 touring parties to the antipodes between 1861 and 1962. Often, but not always, there was more than one vessel involved and they are one of the central themes. Most, the SS Canberra included, were demolished years ago, but those interested in the conditions that HH Stephenson’s 1861 party had to contend with will be surprised and delighted to know that the SS Great Britain is still with us, nowadays a museum ship in Bristol, so anyone can go and get an idea of what conditions might have been like on a two month voyage in Victorian times. Each tour has a single chapter devoted to it. There is a narrative that gives, as well as a description of the vessels involved, a brief commentary on the tour itself, the occasional short pen portrait of a combatant and a few statistics and scorecards. The main purpose of the book however, taking up the bulk of the available space, is a superb selection of photographs and other illustrations, all beautifully reproduced. As would be expected author Andy Collier has included images of all of the ships that are featured, and many of the leading players. There are some photographs from the matches played, including that iconic image of Walter Hammond’s cover drive from 1928/29 and a number of others that will be familiar to seasoned cricket tragics. Many of the illustrations have not been published before however, and have been culled from the author’s own extensive collection and that of David Frith (who provides a lively foreword). To give an example in the chapter on the 1903/04 trip, that which saw Pelham Warner’s team triumph 3-2 and bring the term “The Ashes” back into vogue, there are a total of 35 illustrations across 24 pages. Four of those are of team groups, and another nine of individual players. There is a photograph of RMS Orontes, the ship that took the team to Australia and also took them back at the end of the tour. That vessel is not to be confused with that of the same name on which Douglas Jardine’s side embarked on their famous trip almost thirty years later. Images of buildings (in the main hotels) occupy another four places, three more are of play in progress and as many as 16 are of items of memorabilia, mainly postcards, with a few autographs and other items of printed ephemera. Most interesting of all, and this is the case throughout the book, are reproductions of nine photographs of the players pictured as tourists in the literal sense, rather than as cricketers. The ‘off duty’ moments vary greatly in the nature of the activities being undertaken and in just how relaxed the players appear in each other’s company and, for this reviewer at least, are the highlight of a very fine book. Although any book that stretches, as Across The Oceans does, to more than five hundred pages is going to cause fears that it may drag a little that certainly isn’t the case. The proliferation of illustrations make the book an easy read, and the pithy narrative provides an excellent backdrop. The book has been published in a limited edition of just one hundred copies, all of which have been sold, although Roger Page and Boundary Books have copies in stock, and indeed the author himself does not rule out being able to assist anyone keen to buy a copy. After reviewing a biography of Barry Jarman a fortnight ago Archie has turned his attention to Jarman's predecessor, Wally Grout.